Jason Ivey, a NYC resident who works in the TV episodic production business tells this story about the intolerant. With his permission, I reprint it here. There IS one Chik-fil-A in New York, at NYU. City council speaker Christine Quinn wrote on official stationary to the president of NYU asking him to expel the city’s only location. I just finished a discussion with my co-worker that got me thinking about something in a slightly different way. A couple of years ago, she went from straight to gay and now has a serious girlfriend. We don’t really discuss politics. 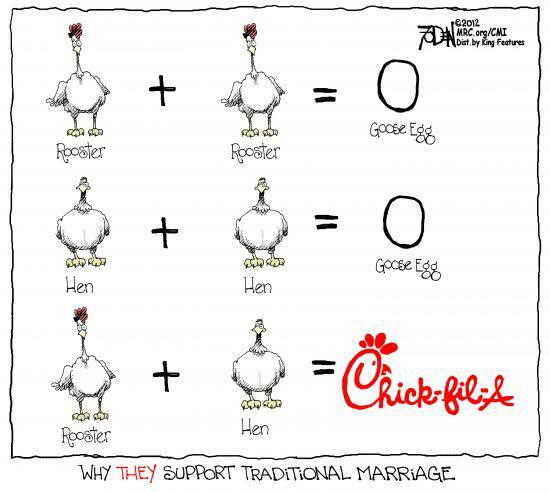 Anyway, she walked back into our office chuckling, as it turns out because she and someone else in the office were making fun of the hate-filled homophobes showing up at Chik-Fil-A. I decided not to let it slide, so I asked if she was on the side of the authoritarians squelching free speech and attempting to deny a business its right to operate in a given city merely because the owner of the company expressed a view on a radio show — a mainstream view at that — but one that didn’t conform to a current fad. Well, no, but that’s not the point. 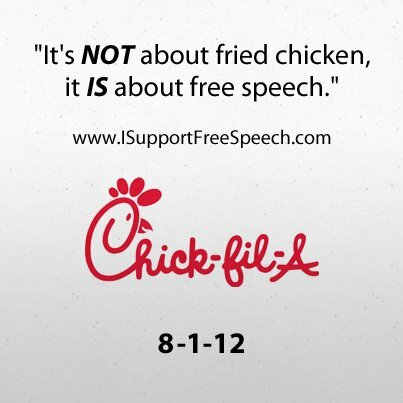 The point to her was that all of these people showing up at Chik-Fil-As had to be gay-haters. Why else would they be doing it? I asked her if she thought I ever gave her any indication that I hated gay people, which she quickly answered no. I asked her if she could then think of any reason I might be opposed to gay marriage, if she agreed I have no animosity toward people who are gay simply for being gay. She told me there was no other argument. I said that just because she was not familiar with such an argument didn’t mean that one didn’t exist. I then proceeded to give the standard argument about why marriage has been defined as one man and one woman for thousands of years (which we’re all familiar with here, I won’t repeat it), and how opposition to gay marriage, for me and many others like me, has to do with acknowledging the reasons and merits of the institution, rather than with the individuals seeking to change it. Her response was to tell me she respected my position, but thought I was obviously in a small minority of people. I said I didn’t think I was, that perhaps I can articulate something others instinctively feel but can’t necessarily intellectualize or make an argument around. I had no hope of changing her view as it directly relates to gay marriage. She wants to feel as accepted and normal as possible, and wants “the same things” others are able to have. Standard argument. The main point I wanted to get across to her was this: when you dismiss, ignore, or deny a valid argument, you inevitably attack the low-hanging fruit. In painting your intellectual opponents as Neanderthals, you — in your own mind — elevate yourself and your argument to a position of moral superiority. By assigning yourself this moral superiority, you’re then given license to bully, which is what’s happening where this issue is concerned. When you’ve been given license to bully, you start accepting authoritarian means to achieve what should be democratic ends. When people have been given the opportunity to actually vote on the subject of gay marriage, they’ve mostly upheld the traditional view. If you write off such exercises as due to the participation of what must be bigots and idiots, then you excuse subverting the democratic process and decreeing rulings of single judges or mayors for instance. The authoritarian impulse is stoked due to feelings of moral superiority, brought about by a failure to understand or recognize the legitimate arguments. I closed the door for this conversation. I asked her what she thought would happen if I were to go around the office telling everyone I was against gay marriage. She laughed, because she knows what would happen. However, having listened to an actual argument, she no longer had any outward hostility toward my view, even though she wasn’t going to eventually agree with me. Like a lot of people, she’s been brain-damaged by the Left and its media. It’s no different than declaring any opposition to Obama’s policies as racist. Create a straw-man argument, put yourself in the morally superior position, then feel free to bully all you want. I pointed out that if you’re going to destroy something, you’d better understand what it is you’re destroying first. And also that what some people consider “progress”, others can consider decay or regress, and have the stats to back it up. 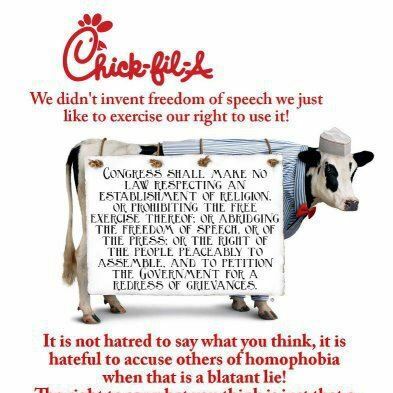 It’s the righteous bullying that gets me more fired up than the issue itself, and I was glad to see some of you participating in the Chik-Fil-A appreciation. My main argument regarding changing the definition of marriage is a legal one although I do agree with the moral one also. Marriage, as a word, has been standing in law as being between 1 man/1 woman without argument since the beginning of time. Now this group of people want to redefine it the way they see fit. What will that do to laws and what word is next to be on the block? -. Should the laws be changed and should we redefine murder next? I know that is a long step and that some of these liberals will say I think they are comparable to murderers. That is not what I said. I am saying WORDS MEAN THINGS. Marriage currently has a meaning. It does not need to be redefined. Trust me. Someone will try to change the definition of murder and they will have precedence to do so. I say that these people should make up another word to describe their ‘loving’ sexual behaviors and leave the word marriage out of it.